Our handmade Yoshihiro VG Stain Resistant Hongasumi Deba is crafted with extraordinary skill by our master artisans. Exemplifying the most intricate techniques of forging, layering, and hammering, VG Steel with a hardness on the Rockwell scale of 62-63, is forged with iron to create the most elaborate of finishes. Only the most skilled of artisans can forge together these metals in such complex puzzle piece formations to fashion knives of this caliber with the highest quality, blending aesthetics and performance. Our Yoshihiro VG Stain Resistance Steel Hongasumi Deba is complimented with a traditional Japanese style handcrafted premium Round-Shaped Rosewood handle with a shitan rosewood bolster. The Deba knife is a heavy knife that was made to filet and butcher whole fish. The heft of the Deba knife allows it to cut through the heads and bones of a fish, and its smaller pointed tip filets the flesh from the bones. The Deba knife can used be for chicken and meat but is not recommended for cutting through large bones. 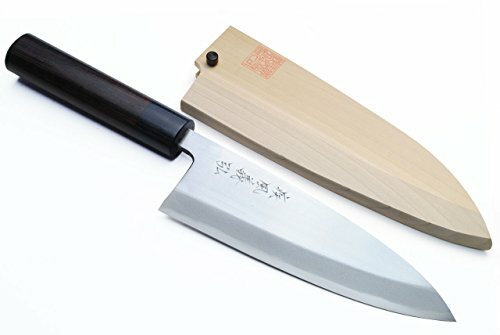 The Deba knife is one of the most essential of traditional Japanese knives and is a powerful component in the repertoire of many chefs. Even the simplest of tasks are elevated with a handcrafted knife that is as beautiful as it is functional. This knife delivers Hongasumi grade, high carbon steel sharpness and edge retention with stainless steel durability and ease of care. Exceptionally forged VG Stainless steel blade with HRC 62-63 combines exceptional sharpness and optimal edge retention with stain resistance. Knife will become extremely sharp with whetstone sharpening and will glide through any type of fish with no pressure. Single edged blade with a traditional grind. Completely flat ground on front (SHINOGI), concave ground (URASUKI) with flat rim (URAOSHI) on the back. Simple and elegant design with a handcrafted Round-Shaped Shitan Rosewood handle with Shitan Bolster for a light and well balanced construction. Excellent for entry and Intermediate level chefs. Natural Magnolia wooden sheath provides odor and stain resistance with ease of cleaning. Hand wash only and sharpen on quality whetstones. Comes ready to use out of the box. 100% handcrafted in Japan. Not mass produced.